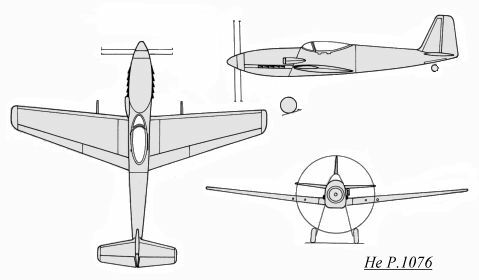 In late 1944, the Heinkel firm designed this project to meet a RLM specification for a fast piston-engined fighter with an good high altitude performance. Designer Siegfried Günter used the He 100 design (which briefly held the world speed record at 746.606 km/h (463 mph) on March 30, 1939) as his inspiration. The He P.1076 was thus designed to have a very smooth surface, and used a surface evaporation cooling system on the engine cowling and the entire fuselage rear section (see drawing below). The wing was slightly swept forward at 8 degrees and was constucted as a two-piece, two spar all metal structure. There were flaps on the entire wing trailing edge, with the outermost as ailerons and the inside ones as landing flaps. Three different engines were envisioned: the Daimler Benz DB 603M, Jumo 213E and Daimler Benz DB 603N (see table below). The landing gear retracted normally, the main gearinto the wing center section and the tail wheel into the rear fuselage. A single 700 liter (185 gallon) fuel tank was located in the fuselage behind the pilot's seat. The cockpit was pressurized and was supplied with a clear-vision canopy. Armament was to consist of one MK 103 30mm cannon firing through the propeller hub, and two wing-mounted MK 108 30mm cannon. 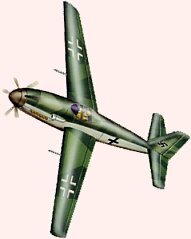 Although this project did not see the light of day (although Siegfried Günter completed detailed drawings and plans for the Americans in mid-1945), it probably would have been one of the fastest piston-engined propeller aircraft ever built.